I used a bread machine on the dough setting. It usually takes around 40 minutes in the bread machine. Press out the dough using the heel of your hand on a greased baking tray. It then takes another 30-60 minutes for proving the dough. 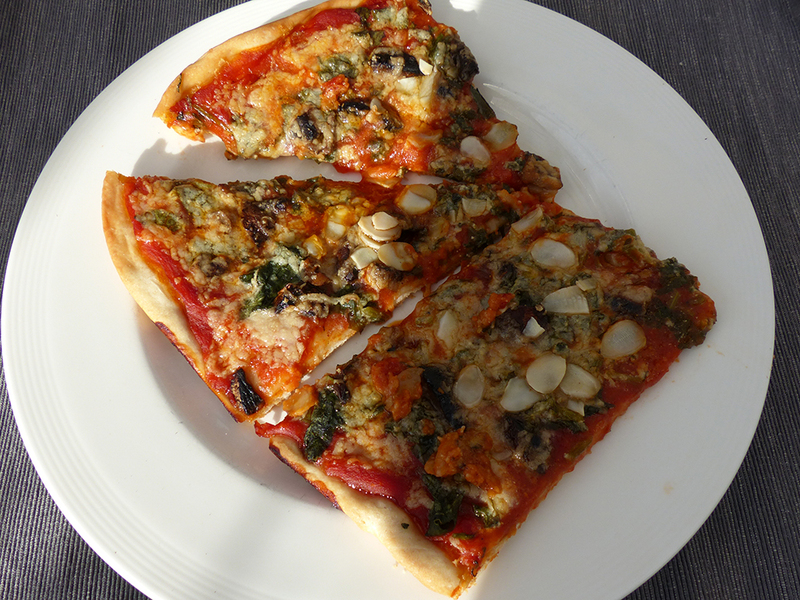 Or you can use gluten free pizza bases for a gluten free alternative. just add all the ingredients in a blender and puree. I've added 2 tbsp plain flour to the sauce to thicken it a little bit, or you can use corn flour for a gluten free option. I used up all the tomato sauce, but it depends on how big your pizza bases are. You can easily freeze the sauce for later use. Mix the chopped mushrooms with the tamari so that the mushrooms are evenly coated. Mix the kale with the olive oil (this prevents burning of the kale). spread the tomato sauce evenly over the pizza bases. Add the kale, mushrooms and cheese and top with flaked almonds. Bake in a preheated (180C / Gas 5) oven for around 20 minutes or until the middle is hot and the dough is cooked. Very simple tomato sauce to use for pizzas. This must be the easiest tomato sauce on the planet! Just put all the ingredients in a blender and puree! !